It is an offence to publish any material that might dissuade people from voting, or encourages voting for or against any party or candidate, on election day. So from midnight until after polling closes all comments to KP will be moderated by Anita, Pablo and myself. But it is not an offence to exhort others to vote, in a nonpartisan fashion. The old cynic’s argument is that if voting made a difference, they would have banned it. In fact, in plenty of places they have banned it for just that reason. Whatever your view of the state of Aotearoan politics, it could be worse. Zimbabwean immigrant Peter Heath this evening called our election-day media ban “quaint”, and it certainly is when compared to the situation there, where (as he says) “officials are too busy with hacked off limbs to worry abt the odd tweet”. Long may it remain so. We honour democracy by supporting it, and in addition to the other aspects of political participation that ultimately means turning out to vote. But people who feel disengaged from the political process, who feel it doesn’t serve their interests, or who refuse to vote on principled grounds shouldn’t be forced to add noise to an already-fuzzy democratic signal. So vote if you have the slightest inclination to do so, and if you haven’t the slightest, don’t. But remember, this time around you have four votes: your two electoral votes are for New Zealand’s political body for the coming three years, but your two referendum votes are for its political soul. there is a pretty great opportunity to use the Maori seats to rort the system: if you had two Maori Parties, one that ran electoral candidates in six out of the seven electorates and only canvased for electorate votes, and another that had a safe seat in the seventh electorate and only canvased for party list votes in the other regions then you could, conceivably, end up with a dozen MPs (albeit with some overhang due to your electorate imbalance) and hold the balance of power in perpetuity. Danyl’s scheme is essentially what the Greens tentatively proposed before the last election: green voters in Māori electorates consider casting electorate votes for the māori party candidate, and māori party voters cast their party vote for the Greens. The proposal was rejected by the māori party, which at the time was (in my view) a tactical error but a wise strategic choice. Those factors which made the plan a strong strategic risk for the māori party in 2008 now no longer obtain, or at least not so strongly. It has largely sacrificed its independence from the Pākehā political mainstream anyway, and could potentially lose considerable support for that reason. It may hang onto electorates, but it is likely that ‘brand’ support is lower than before. So with the benefit of hingsight, they might as well have gone with the Greens last time. Nowadays, they have a radical wing-man in Hone, who will work with them and who shares, despite all the rhetorical ructions, considerable common ground with the party’s other members and its foundational kaupapa. They can work together; Hone working to attract the ‘brand’ support for an independent indigenous party, the existing māori party maintaining their electorate positions and continuing to work within the mainstream. I’m not convinced this will happen — as the Richards say in comments to Danyl’s post, a lot of it is personality-bound — but it could work in principle. There’s one other factor, though. Although ACT and National have been collaborating in this way since Rodney Hide was gifted Epsom, the moment the māori party and a new radical wing led by Hone start doing it, the headline will be “Maaries rorting democracy to establish an apartheid state”. Those who’ve been benefiting from this sort of positive-sum electoral coordination for years will be those most urgently banging that drum and waving those banners. That’s a powerful disincentive. Edit to add: Of course, there’s also a referendum on MMP on the day of the election. A scheme such as this would be an outstanding means of undermining MMP’s popular support and endangering its future. The speech bubbles are blank because Peter is running a caption competition to find a punchline. Demonstrating piercing insight into his relevance to NZ politics, he has chosen the Kiwiblog Right for these words of inspiration. Personally, I think that leaving them blank perfectly captures the character of this campaign: inchoate, futile, tone-deaf irrelevance. Hopefully he won’t be too disheartened by the far-from-enthusiastic response of Farrar’s captive authoritarians. It has been found to work pretty well and all parliamentary parties except ACT support it. The UK election is about to remind people how perverse FPP is. Peter Shirtcliffe is spamming people in order to gain support for his anti-MMP campaign. Thanks, Peter, you’re doing your country a great service. [This line inserted to fill whitespace]. Peter Shirtcliffe is furious (audio), and well he might be, because the government’s plans for electoral reform are eminently sensible, subject to wide bipartisan support, and most critically, not at all hasty. 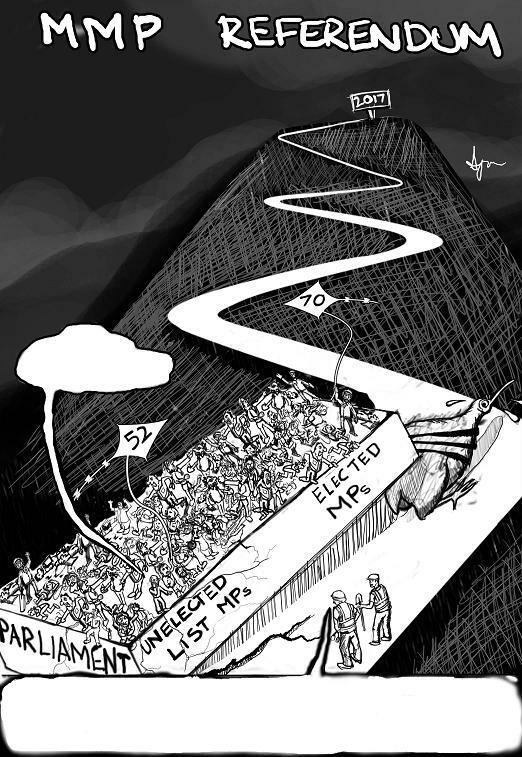 This is electoral reform done right: for change, a majority of voters must reject the status quo system outright at two consecutive general elections, with plenty of time for reflection, consultation and campaigning before each. Shirtcliffe’s proposal for a one-off vote on which electoral system to use at the 2011 election makes only one concession from his holy grail of government decisiveness: he thinks it should be preferential. His scheme aims to deliver that grail to his beloved National party wholesale and for good, by springing fundamental constitutional change upon the NZ electorate with less than two years’ notice and discussion, with no societal safety net, no cooling-off period, no opportunity for reflection. It would turn the time between now and the 2011 general election into an all-out propaganda war for the future of democracy in New Zealand, a war in which the National government and its allies hold all the strategic ground: unprecedented popular support and an opposition at its nadir; confused and rebranding environmental and social justice movements; the recent memory of an unpopular and dysfunctional government which represented all that people thought was wrong with MMP; a political environment in which many people will simply vote for what That Nice Man John Key recommends; and an anti-MMP lobby which is practiced, prepared and very well-resourced. Shirtcliffe’s careful circumspection — refusal to express opinions on such matters as what system should be adopted, and how campaign funding should be managed — and flattery of the plebiscite (“we’ve got an intelligent electorate out there”) seeks to hide this behind a high-handed neutrality of purpose, masking the fact that the process he advocates yields his own cause very great advantages. Shirtcliffe’s decisiveness imperative insists that the winner must take all, in elections and in constitutional reform as in heavyweight boxing: a few ceremonial minutes in an enclosed space which determine who is the winner and who is the loser, and all that happens in between bouts is meaningless hype. It is not a democratic model, it is not a consultative model, it is not a model which gives adequate consideration to the views and opinions of the electorate at large; far from respecting electors as intelligent and capable actors, it reduces politics for the individual voter to a single, somewhat inconvenient event which happens once every three years, or in the case of something as important as changing the electoral system, once every generation or so if we’re very fortunate. Fortunately for New Zealand, and indeed to the great credit of the National party, he has been denied. The proposed framework should yield a legitimate and durable result, and one which should be supported even by those whose preferred option is not selected. There’s much which could go awry yet, but this framework is as good as we could hope for. Idiot/Savant’s assertion that “if we want to protect MMP, its not enough simply to vote for no change in 2011 – we also have to chuck out National, just to be on the safe side” seems a little overwrought — National under Key has taken to MMP like a duck to water, learning to play both ends against the middle in a way the Clark government never did. And although there have been some recent cat-herding problems to do with keeping errant ministers in line, and around the rugby world cup, I can’t see a desire to return to the bad old days of one party rule. I do think National will campaign hard for SM as an it’s-the-same-really-only-better option, and this provides Labour and the Greens a good opportunity to differentiate itself — by pushing for MMP-as-it-is-now, or MMP-with-some-changes; although it must be said Labour aren’t behaving much like MMP-aware political actors these days. A larger threat from the National party, I believe, is the possibility of rolling the abolition of Māori seats into the new electoral system, or choosing to support an electoral system in a second referendum which (they may claim) renders the seats obsolete. This will be a strong wedge, and will enable National to frame the debate in terms beneficial to its own interests. I await the further propagandisation of electoral systems with interest. Meanwhile, I/S’s conclusion is unarguable: “we need to make it clear to both parties: our democracy is non-negotiable.” And I’m still interested in peoples’ responses to the question: what kind of electoral system do we actually want? Two topics in this post, because I don’t have time to fully develop them. First, John Key must not ignore the anti-smacking referendum. Although the question was leading, the result was decisive and will embolden people like the Copeland/Baldock/McCoskrie axis of evil to drive the stake deeper into the heart of NZ’s traditional social liberalism. Tinkering with guidelines won’t mollify them, and won’t stop the electorate from listening to them because it doesn’t address the substantive point about the status of a light smack in law. What will do that is the Borrows Amendment. With a view to neutralising further attacks on the discipline legislation, I think the government should adopt and pass the Borrows Amendment with due haste, and put the issue to bed (without its dinner). It’s a mutual-second-best solution, whereas the repeal as passed in 2007 was not and will not endure. Second, Rodney Hide’s position on the Auckland mana whenua seats is consistent and his behaviour is responsible. The (proposed) mana whenua seats in the Auckland case aren’t the same as the Māori electoral seats – they’re appointed, not elected, and this gives him separate grounds to oppose them. It is not inconsistent that he favours entrenching Māori electoral seats if they exist, but not of implementing any more such seats, and not implementing any seats which aren’t elected. He’s being responsible in clearly signaling his intentions in a fairly measured way. He’s not trying to exercise any more power than he has, but simply saying ‘my resignation will be a cost of making this decision, just so you know’ and requiring John Key to consider whether that cost is worth it. In addition, he’s working with Pita Sharples on the issue rather than taking a reflexively oppositional approach. Finally, this is strengthening his core political brand. It’s smart politics all around because whether he gets his way or not, he comes out of this looking good. Update: A third thing – eternal guest-poster r0b at The Standard continues to go from strength to strength. It is rare in NZ that we get a chance to participate simply because people campaigned for that chance, and this referendum is one of those chances. 300,000 people signed a petition and hundreds of people carried those petitions around, arranged for people to sign them, and for them to be returned, counted and presented to Parliament. I don’t agree with their opinion about smacking, but I agree with their attitude to democracy and participation. So this is your chance. If you haven’t voted in the referendum yet, do it now! Votes posted on Thursday (early enough for collection) will be counted. It is a sunny Wellington spring day; I walked past crocuses and the beginning of daffodils to get my ballot paper, and past trees starting to show their spring growth to post it. I voted yes because I believe smacking children is wrong. I voted yes because I want to reaffirm that the Christian right do not speak for me. Many many (many) Christians in New Zealand believe, as I do, that smacking is wrong. I voted yes because countless people gained the signatures of 300,000 voters to give me the opportunity to say out loud what I believe. I voted yes because I want to live in a country where children are hugged, held, comforted, and raised to be non-violent adults. I voted yes because I love.